Each year we are faced with more frequent and more destructive storms. The earth’s natural land buffers wetlands, coastal dunes, barrier islands, and mangroves are disappearing at a rapid rate. Habitat restoration and protection of these key areas is essential to reduce the risk of coastal flooding and erosion. An effective approach is to use a combination of engineered structures to protect the natural ecosystems from storms and erosion while allowing the natural ecosystem a chance to develop and grow stronger. For example, the use of geotextile tubes in breakwater applications reduces erosion and protects the shoreline. High performance permanent turf reinforcement mats provide permanent armoring and vegetation support in critical areas. The use of all natural methods such as temporary erosion control blankets, coir mats and coir logs in sensitive areas aids in habitat restoration. Please contact our sales office at 609-971-8810. We welcome the opportunity to discuss your project and how some of our products can be used to protect and preserve our environment for future generations. Each year we are faced with more frequent and more destructive storms. The earth’s natural land buffers wetlands, coastal dunes, barrier islands, and mangroves are disappearing at a rapid rate. Restoration and protection of these key areas is essential to reduce the risk of coastal flooding and erosion. An effective approach is to use a combination of engineered structures to protect the natural ecosystems from storms and erosion while allowing the natural ecosystem a chance to develop and grow stronger. For example, the use of eotextile tubes in breakwater applications reduces erosion and protects the shoreline. High performance permanent turf reinforcement mats provide permanent armoring and vegetation support in critical areas. The use of all natural methods such as temporary erosion control blankets, coir mats and coir logs in sensitive areas aids in natural habitat restoration. Channels, streambanks and shorelines are prone to erosion problems due to topography, flooding, runoff, and flow conditions. Traditional hard-armor systems such as riprap are expensive and aesthetically unattractive. However, erosion control blankets and coir logs are an economical solution to vegetation establishment. Restoring the environment back to its natural state not only benefits us but the ecosystem that depends upon it. Wetlands are important to our ecosystems as well as to our environment. They provide a habitat for wildlife while improving the water quality. They also reduce flood and storm damage by providing a natural buffer during surges. More than half of the world’s original wetlands have been destroyed by overdevelopment and pollution. Therefore, there is a growing need to restore them. Soil bioengineering relies upon vegetation to stabilize erodible soils while returning the environment back to its natural state. Coir mats, coir logs and all natural erosion control products are cost-effective options. They provide erosion protection allowing the roots and shoots of native plants to colonize and stabilize stream banks, wetlands, or hills. This offers a long-term solution to erosion protection. Shoreline stabilization and habitat restoration projects often require geosynthetics along with erosion control methods to stabilize and encourage natural growth. The combination of geosynthetic stabilization and a slope reinforcement system are necessary when the need to fortify an area and restore it back to the natural setting is required. 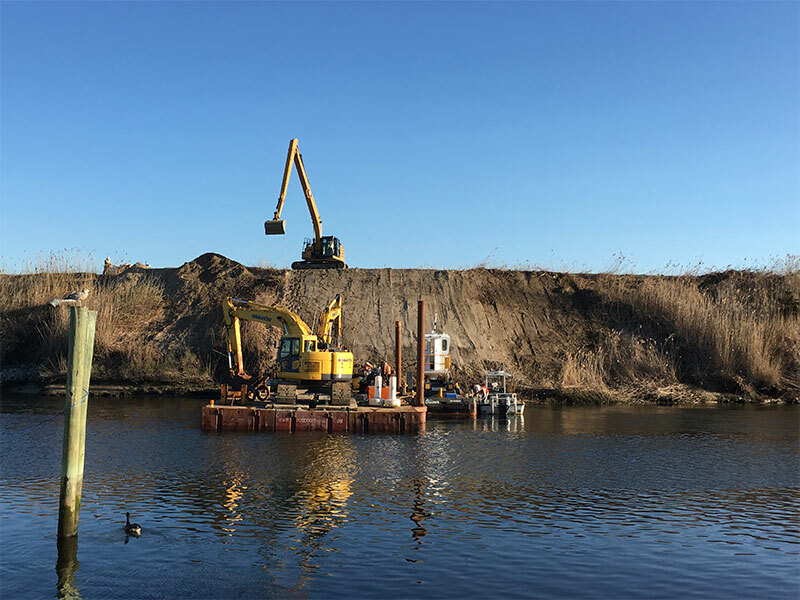 This type of scenario was addressed by IWT Cargo-Guard when called upon by Village Dock Contracting to supply a NJDOT Dredge Project dredging the channels in and around the Manasquan River in Point Pleasant, New Jersey. The dredge spoils pulled from the river were deemed unacceptable for beach replenishment due to contamination. As a result, they were deposited on Gull Island, a confined disposal facility. CDFs are one of the most widely used technologies for managing contaminated sediments. A CDF is an engineered structure designed to provide the required storage volume for dredged material and to meet the required suspended solids in effluent released from the facility. Shoreline stabilization and restoration projects often require geosynthetics along with erosion control methods to stabilize and encourage natural growth. The combination of geosynthetic stabilization and a slope reinforcement system are necessary when the need to fortify an area and restore it back to the natural setting is required. This type of scenario was addressed by IWT Cargo-Guard when called upon by Village Dock Contracting to supply a NJDOT Dredge Project dredging the channels in and around the Manasquan River in Point Pleasant, New Jersey. The dredge spoils pulled from the river were deemed unacceptable for beach replenishment due to contamination. As a result they were deposited on Gull Island, a confined disposal facility. CDFs are one of the most widely used technologies for managing contaminated sediments. A CDF is an engineered structure designed to provide the required storage volume for dredged material and to meet the required suspended solids in effluent released from the facility. To create the area they needed to support all the dredge discharge, they had to build up another area. It was specified to utilize multiple geogrid layers in between lifts in order to reinforce the area which sat adjacent to the slope that was slowly impeding on the shipping channel lying below. Miragrid XT series geogrid was applied in between the lifts to create a permeable, stabilized, load bearing area. 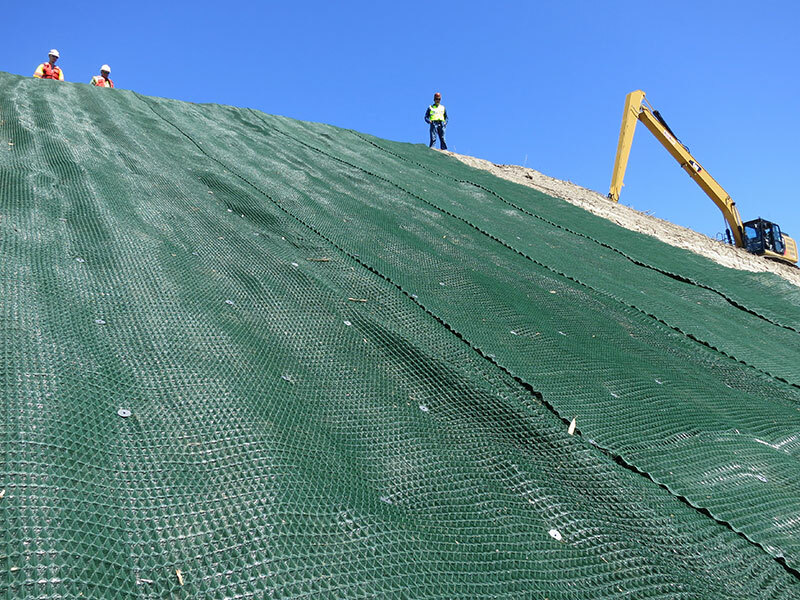 Once the geogrid was in place, they had to reinforce the slopes along the shipping channel with a High Performance Turf Reinforcement Matting System. Armormax was the specified system for this project. ARMORMAX® Engineered Earth Armoring Solutions™ is composed of High Performance Turf Reinforcement Mats (HPTRMs) and Engineered Earth Anchors™ (EEA) that work together to lock soil in place and protect against hydraulic stresses. This system provided the dynamic erosion control and slope stabilization solution the NJDOT was expecting. Within months the slope was covered in phragmites, and returned back to its natural state. The steep slope holding back years of dredge spoils now has new erosion control fortification. The commercial fishing fleet can now conduct its daily business without fear of the slope slumping into the channel. The slope itself now has a system that contains the rich soils and sediments that tend to leach into the waterways when not properly vegetated or stabilized. A win for shoreline preservation and the water quality. Ask us at IWT Cargo-Guard how we can offer a solution to your shoreline stabilization and habitat restoration requirements. The steep slope holding back years of dredge spoils now has new erosion control fortification. The commercial fishing fleet can now conduct its daily business without fear of the slope slumping into the channel. The slope itself now has a system that contains the rich soils and sediments that tend to leach into the waterways when not properly vegetated or stabilized. A win for shoreline preservation and the water quality. Ask us at IWT Cargo-Guard how we can offer a solution to your shoreline stabilization and restoration requirements.